Background and Objectives Although low socioeconomic status has been considered a contraindication to peritoneal dialysis (PD), no published data clearly link it to poor outcomes. The goal of this study was assessing the effect of income on survival in the Brazilian Peritoneal Dialysis Multicenter Study. Design, setting, participants, & measurements Incident PD patients enrolled in this prospective cohort from December 2004 to October 2007 were divided according to monthly family income. The median age was 59 years, 54% were women, 60% Caucasians, 41% diabetics, and 24% had cardiovascular disease. Most of them were in continuous ambulatory PD, had not received predialysis care, had <4 school years, and had a family income of <5 minimum wage (80%). Survival analysis was performed using the Kaplan-Meier method and the Cox proportional hazards model adjusting the results for age, gender, educational status, predialysis care, first therapy, PD modality, calendar year, and comorbidities. Results There were no differences in technique (log rank test χ2 = 4.36) and patient (log rank test χ2 = 2.92) survival between the groups. In the multivariate analysis, low family income remained not associated either to worse technique survival (hazard ratio [HR] = 1.29; 95% confidence interval [CI] = 0.91 to 1.84) or to patient survival (HR = 1.40; 95% CI = 0.99 to 1.99). Conclusions According to these results, economic status is not independently associated with outcomes in this large cohort and should not be considered a barrier for PD indication. The associations between economic status (ES) with clinical outcome in health and disease are complex and multifaceted. Lack of access to healthcare, disparate treatment experiences, lower patient educational level, and inadequate health-seeking behaviors are conditions that further disadvantage the low ES population (1,2). Strong associations between lower income and higher mortality risk in the general population have been described in Latin American countries (3). There is solid evidence of a link between low socioeconomic status and the incidence of chronic kidney disease (CKD) (2,4). An association between low socioeconomic status and poorer survival on renal replacement therapy (RRT) has been reported, with evidence implicating personal and environmental factors, such as health-related behavior and social stratification in communities, rather than financial or structural barriers to care (4,5). There is a lack of studies, however, to assess the association between income and mortality risk among patients on peritoneal dialysis (PD). When PD evolved into a home therapy in the late 1970s, it was believed that only the most educated and well-off patients could be eligible for this RRT modality. This biased consideration was an initial barrier to the expansion of home PD outside the developed world. Despite this, in 1980, continuous ambulatory PD (CAPD) was introduced in Brazil, and today Mexico has the largest PD population in a single country (6). Currently, Latin America accounts for 25% of the home PD population in the world (7). Despite the lack of evidence linking low socioeconomic status to poor outcomes in PD, low income level remains a potential concern for many nephrologists when choosing PD as the RRT. Large observational studies, including detailed information on socioeconomic status in the PD population, are scarce. The Brazilian Peritoneal Dialysis Multicenter Study (BRAZPD) is a large prospective cohort study that was launched in December 2004 (8). In BRAZPD, nationally representative data are collected monthly and prospectively, allowing a continuous snapshot of the PD reality in the country. The BRAZPD data provide a substrate for exploratory analysis to expand technical knowledge and consequently improve the quality of care for PD patients. The goal of this study was to assess the effect of income on survival in BRAZPD cohort. For this study, we used the BRAZPD data of incident PD patients to verify whether family income is associated with patient and technique survival. Because a substantial number of patients treated with PD in Brazil present with low ES, in contrast to the registries from the developed world, the BRAZPD population provides a unique opportunity to assess the effect of different ES on outcomes. Incident PD patients recruited from 114 dialysis centers and reporting monthly to BRAZPD from December 2004 through October 2007 were included in this study. All of the patients were 18 years or older, remained at least 90 days on PD, and provided complete information on socioeconomic status. This study was conducted in accordance with the Declaration of Helsinki, and all participants provided written informed consent before enrollment. Details of the study design and the characteristics of the cohort are described elsewhere (8). Out of a total of 3439 incident patients enrolled in the BRAZPD, 1952 were eligible for the study, whereas 867 were excluded for not completing 90 days in the therapy, 418 because of a lack of complete socioeconomic data, and 202 for not having complete data information. Demographic and socioeconomic data, etiology of CKD, therapy history, comorbidities, height, weight, body mass index (BMI), blood pressure (BP), and laboratory measurements of blood samples at patients' admission in the study were included in the analysis. Creatinine, urea, potassium, calcium, phosphate, glucose, hemoglobin, and albumin were measured by using routine methods. Davies' comorbidity scores were used to access the severity of comorbid conditions (9). Socioeconomic assessment included family income, educational level, and distance between home and dialysis center. Family income was used to infer the ES and was categorized according to the amount of received minimum wage (MW) per month, which is the reference value in Brazil. The BRAZPD electronic form was designed following the model of the Brazilian Institute of Geography and Statistics, which is the entity responsible for the Brazilian census (10). The question about family income had six possible responses: no income, income <2 MW, income between 2 and 5 MW, income between 5 and 10 MW, income between 10 and 20 MW, and income >20 MW per month. Information obtained from official sources of the Brazilian government served as the basis for the characterization of the groups according to family income (10,11). The patients were divided into three groups according to monthly family income at the start of the therapy: low (<2 MW), middle (2 to 5 MW), and high (>5 MW) ES, and the demographic, clinical, and laboratorial data were evaluated in each group. To give a character of universality to the analysis, we conducted a pairing between Brazilian currency (Real [R$]) and U.S. dollars (USD [$]) for the period of study observation. Between December 2004 and October 2007, on average, USD $1.00 was equivalent to R$2.22 and the Brazilian MW, which is the same for the whole country, adjusted on an yearly basis, was equivalent to USD $150.42/mo (USD $4.94/d) (11). From this pairing, we applied the concepts of ethical poverty line (EPL) (12) and gross domestic product (GDP) per capita to choose the three levels of family income used. The monthly family income of 2 MW (USD $9.88/d) was considered as equivalent to EPL. The International Poverty Centre suggests USD $2.70 per person per day as the EPL (12), and considering that 3.2 is the average number of individuals per family living in private dwellings in the country (10), 2 MW of monthly family income (USD $3.08/person/d) is the closest to the corresponding EPL in Brazil. The monthly income of 5 MW (USD $7.71/person/d) was considered as the reference for Brazilian GDP per capita. In 2005, Brazilian GDP per capita was R$ 6378.30/yr (USD $2873.11/yr or USD $7.87/d) (13). All of the variables were expressed as the means ± SD or as median (10th to 90th percentile), unless otherwise indicated. Statistical significance was set at the level of P <0.05. Differences among more than two groups were tested using one-way ANOVA or a Kruskal–Wallis test, followed by a post hoc Dunnett's test for parametric comparisons when assessing differences in ES groups. A χ2 test was used for categorical variables. A multinomial logistic regression model was used to assess the association for low ES group. 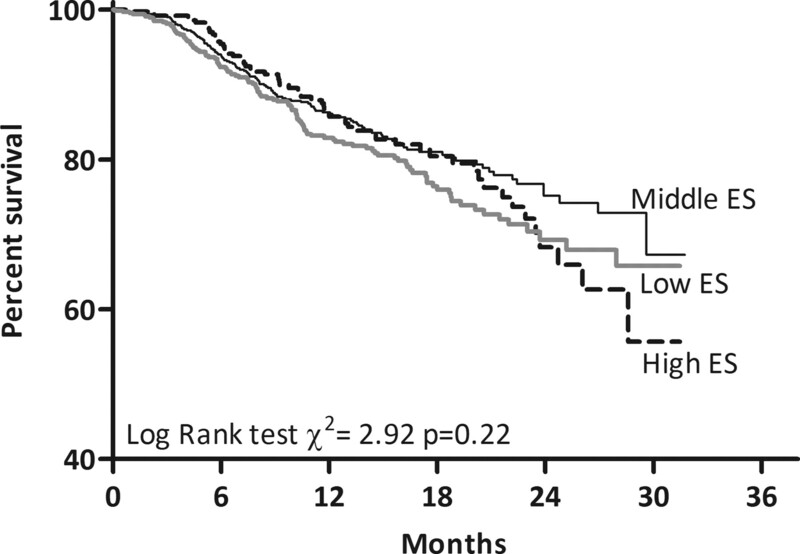 Survival was estimated after a mean follow-up of 13 months (range, 3 to 34 months). Survival analysis used the Kaplan-Meier survival method and the Cox proportional hazards model. In the Kaplan-Meier curves for the probability of patient survival according to income level, death was the event, whereas transplantation, transfer to hemodialysis (HD) (informative censoring), and recovery of renal function were censored observations. In Kaplan-Meier curves for the probability of technique survival, transfer to HD was the event, whereas death, transplantation, and recovery of renal function were censored observations. The Cox proportional hazards model was used to estimate hazard ratio (HR) adjustment for potential confounding factors (age, gender, PD modality, first RRT, predialysis monitoring, educational level, calendar year, and the presence of cardiovascular disease [CVD] and diabetes mellitus [DM]). All of the statistical analyses were performed with SAS software (version 9.2; SAS Institute, Inc., Cary, NC). Because the P values are not adjusted for multiple testing, they have to be considered as descriptive. The median age of the 1952 incident PD patients was 59 years (range, 36 to 78 years), 54% were women, 60% were Caucasians, 41% were diabetic, and 24% had a previous history of CVD. CAPD was the PD modality for 55% of the patients. Approximately 54% were in PD because of a medical indication, 28% were in PD by personal preference, and PD was the only RRT feasible in 18% of the patients. The majority of patients (68%) starting PD were transferred from HD, and the median time on HD before switching to PD was 10.7 months (range, 0.7 to 67.9). The patients were mainly referred to nephrologists from internists (31%), and 18% of them came from an emergency unit. In this cohort, 58% of patients had not received predialysis care, 67% were illiterate or had <4 school years, and 80% had a family income <5 MW per month. Glucose-based PD solutions were prescribed for all patients (Dianeal, Baxter Healthcare), and HomechoiceTM (Baxter Healthcare) was the cycler used for automated PD (APD). There were no statistically significant differences among the three ES groups in relation to mean BP, serum creatinine, urea, calcium and glucose. There were no significant differences among the three ES groups when analyzing the 867 patients excluded from the study for not having completed 90 days in the therapy. In this group of excluded patients, 21% were in a high ES, 43% middle ES, and 36% low ES, whereas in the patients included in this study 20% were in a high, 44% middle, and 36% low SE, respectively. As shown in Table 1, several baseline characteristics varied by ES categories. More patients with low ES had HD as the first RRT, were referred later to a nephrologist and were treated with CAPD. S-albumin, hemoglobin, and BMI values were lower in the low ES group as compared with the other groups. High ES group patients were more frequently treated with APD. In this group of patients, >4 school years of education, male gender, older age, and Caucasian race were also more prevalent, and there was a higher percentage of patients with DM, CVD, and higher Davies comorbidity score (9) in contrast to other ES groups. Table 2 shows the variables significantly associated with low ES after covariate adjustments in a multivariate logistic regression. The odds of low ES were significantly lower for older patients, men, patients with higher BMI, presence of CVD, PD as the first RRT, and patients with a higher education level. The follow-up period ranged from 3 to 34 months, and during this period 307 patients died (16%). Causes of death were classified as cardiovascular in 42%, infection related (14%) or not (15%) to PD therapy, other (17%), and unknown (12%). There was no difference among income groups according to causes of death (Table 3). The reasons for dropout (n = 270) are shown in Table 4. Transfer to HD by patient choice was the most prevalent cause (32%), and no significant difference was found in reasons for dropout among income level groups (P = 0.195). The 2-year patient survival was 70%, and technique survival was 73%. Cumulative patient survival did not vary significantly (log rank test χ2 = 2.92, P = 0.22) among the three ES groups (Figure 1). Furthermore, no statistically significant difference in technique survival (log rank test χ2 = 4.36, P = 0.11) was observed (Figure 2). Kaplan–Meier curves for the probability of patient survival according to income level. Death is the event; transplantation and recovery of renal function are censored observations. ES, economic status. Kaplan–Meier curves for the probability of technique survival. Transfer to hemodialysis is the event; death, transplantation, and recovery of renal function are censored observations. ES, economic status. In a multivariate Cox regression analysis, no statistical difference in patient (Table 5) and technique survival (Table 6) according to ES was observed. We found that younger patients had better survival than older irrespective of ES group. The gender and modality have not had significant influence in the various groups of ES. The crude HR for patient survival was not significantly different among the three groups, but a trend was observed in the low ES group in technique survival. Furthermore, when adjusted for age, gender, and modality, a trend was observed in the low ES when compared with the high ES group: HR = 1.34, 95% confidence interval (CI) = 0.97 to 1.85, P = 0.07 for patient survival, and HR = 1.36, CI = 0.96 to 1.89, P = 0.06 for technique survival. This trend remained when adjusted for RRT and time of referral for patient survival (HR = 1.32, CI = 0.96 to 1.82, P = 0.08) and for technique survival (HR = 1.33, CI = 0.97 to 1.85, P = 0.07). When adjusting for educational level, CVD, DM, and calendar year, the trend remained only for patient survival (HR = 1.40, CI = 0.99 to 1.99, P = 0.05) but not for technique survival (HR = 1.29, CI = 0.91 to 1.84, P = 0.15). A separate Multivariate Cox regression analysis on the subgroup of incident PD patients who started CAPD or APD as initial therapy was performed with the results showing no statistically significant difference in neither patient (middle ES: HR = 0.85, 95% CI = 0.49 to 1.47, P = 0.56 and low ES: HR = 1.47, 95% CI = 0.81 to 2.68, P = 0.21) or technique survival (middle ES: HR = 2.1, 95% CI = 0.81 to 5.23, P = 0.13 and low ES: HR = 1.93, 95% CI = 0.67 to 5.55, P = 0.22) according to ES. Although low socioeconomic status has been considered a contraindication to PD, no published data clearly link it to poor outcomes. In this study, we analyzed the independent effect of family income on patient and technique survival of a large cohort of incident maintenance PD patients (BRAZPD), and the results do not support differences by ES in patient and technique survival. Moreover, no important variation was observed among the ES groups in the distribution of causes of death and the likelihood of dropout. The word poverty carries different connotations. There are data suggesting that the health of poor men around the world is in particular jeopardy with high rates of illness, injury, disability, and premature death (14). In a study comparing the magnitude of inequalities in mortality and self-assessed health among 22 countries in Europe, Mackenbach et al. (15) found that the rates of death and poorer self-assessments of health were substantially higher in groups of lower ES. However, few studies have shown the effect of financial status on survival of patients on RRT. In a recent population-based study conducted with patients undergoing HD in Michigan, Eisenstein et al. (5) demonstrated an inverse relationship between mortality adjusted for clinical factors and residential area income. Other studies reported that low income individuals, besides having poor access to early diagnosis and conservative treatment of CKD, also have limited access to dialysis, treatment of clinical complications, and kidney transplantation, which could as a consequence lead to unsatisfactory outcome (1,4,16). Interestingly, Sanabria et al. (17), comparing PD and HD in a cohort of 923 patients in Colombia, reported that even though in their cohort PD patients were poorer and had higher comorbidity scores than HD patients no survival differences were observed. In Brazil, RRT is funded mostly by the government and is available irrespective of the patients' ability to pay (7,18). However, there are considerable differences in the general population access to healthcare, sanitation, and other basic services according to socioeconomic status (7,18). This observed disparity may be associated with worse overall survival rate. Family support for sick people in Brazil is a cultural feature of society, independent of economic status. PD patients, regardless of income level, are cared for by their families. If there is no family support, the patients remain on HD until exhaustion of therapeutic possibilities. Despite the negative selection (only 28% of patients actually chose PD as a RRT modality) and unfavorable characteristics, the clinical indicators of the incident BRAZPD patients are in accordance with the Spanish PD guidelines targets (19,20), and its survival is equivalent to that reported in other series (21–24). In the Canada-USA Peritoneal Dialysis Study (CANUSA), the 2-year patient and technique survival were 79.7% and 75% in Canada and 63.2% and 78% in the United States, respectively (21). In the Adequacy in Asian Small-Volume Peritoneal Dialysis (ASPD) study, the overall survival rates at 2 and 4 years were 94.0% and 74.8%, respectively, and the technique survival rate at 4 years was 93.4% (22). Mujais et al. (23) described slightly higher 2-year patient and technique survival rates in patients new to dialysis (75.8% and 67.1%) compared with those transferred from HD in the USA (71.4% and 60.5%). In the European Automated Peritoneal Dialysis Outcomes Study (EAPOS), the 2-year actuarial patient, pure technique, and combined patient and technique survival rates were 78%, 62%, and 49%, respectively (24). The BRAZPD is the largest prospective cohort study so far conducted in PD. Other studies of similar design, such as CANUSA (680 incident patients) (21), ASPD (294 incident patients) (22), and EAPOS (177 prevalent patients) (24), analyzed a significant but lower number of patients. Brazil is a country of continental dimensions, with large ethnic, geographic, and cultural diversity, and with substantial social and regional inequalities (3,10). Brazilian PD patients have social characteristics similar to the ones described in other studies performed in Latin America that point to a low ES in this population group (7,17,25). These factors make the results of this study fairly representative, at least for the Latin American countries. Indeed, Moretta et al. (25) have recently reported the results of a multicenter cross-sectional study performed in a population representing almost 30% of the PD patients in Argentina and Uruguay. Regarding socioeconomic status, 44% of all patients were under the poverty line, and 25% of all patients were required to start on PD because there was no other RRT option available (25). It is observed that important differences exist in relation to social and clinical profiles of the three family income groups in this study. Low ES patients had lower educational levels, were more likely later referred to nephrologists, had HD as first dialysis therapy, and had lower BMI as well as serum albumin and hemoglobin. On the other hand, high ES patients were predominantly Caucasian and older, had more comorbidities, and comprised the highest percentage of patients on APD. The difference between groups in which PD modality (CAPD or APD) was offered may have been motivated by economic or social aspects, even though there is no consistent evidence available. The younger patients had better survival than older ones irrespective of ES group. On the other hand, neither gender nor PD modality had any survival advantage in the different groups of ES. Furthermore, no statistically significant difference in either patient or technique survival according to ES was observed in a multivariate Cox analysis, performed in the subgroup of incident PD patients who started CAPD or APD as initial therapy. It is natural to believe that if most low ES patients are referred late for dialysis and/or are initiated on HD and/or when transferred to PD (most likely because of problems with HD) are not offered APD, these factors may contribute to a less favorable outcome. In our study with incident PD patients in Brazil, the crude hazard ratios were not significantly different among the three ES groups, indicating that against all odds for the low ES group, survival was not different than for the other two ES groups. An improvement in early referral, predialysis information on the different dialysis options and patient choice of the therapy, which are possible correcting actions to be taken in every dialysis unit, should certainly lead to a better outcome in all patients regardless of ES. Although the lack of a significant finding supports our primary observation, it is important to underscore the fact that the low ES group showed a trend to higher mortality when compared with the high ES group after adjustment for the potential confounders. The HR increases from the crude analysis to the adjusted models, but the adjusted models have similar HR. Furthermore, regarding the significance of these findings, none reach statistical significance, and one must always be careful when doing multiple comparisons without adjusting the definition of a significant P value. In this study, P values were not adjusted for multiple comparisons, and they have been considered as descriptive. The PD population represents only 10% of the total patients on dialysis in Brazil (7,18), and low ES is often considered a relative contraindication for PD. The responsibility of the nephrologist is to choose a modality that is medically adequate, acceptable to the patient, and sustainable over a period of time (26). According to Jager et al. (27), in the absence of differences in outcomes between patients starting with HD or PD therapy and provided there are no contraindications to one of these modalities, patient preference should have a major role in modality selection. The aim of this study was not to compare PD versus HD, but it is important to note that the majority (68%) of patients starting PD had been transferred from HD. To compare PD versus HD and ES, a prospective trial is needed, and such a study has now been initiated in Brazil. Our study has some limitations. First, we relied on registry data, and the limitations of this study model are well known. Second, we lack some data on the period before and after the PD treatment. Third, our classification of income was on the basis of data at the time of dialysis inception. Because some participants may have had a different income after commencing dialysis, the resulting misclassification may have introduced bias. Moreover, the methodology we used to calculate income needed some approximations. We attempted to reduce the effect of this imprecision by categorizing income, reducing the risk of misclassification. Finally, the statistical methods for survival analysis applied in this study offer limited options for censoring the patients who are transplanted, transferred to HD, or lost to follow-up. In summary, the demographic characteristics of the population in this study were similar to those of the Brazilian dialysis population in general and PD patients in particular and can thus be considered as representative (7,18). Examination of clinical outcome of the BRAZPD incidents patients, a population with a great deal of poor social indicators, reveals that technique and patient survival are not different from the ones reported elsewhere (21–24). The BRAZPD study results indicate that ES is not a significant predictor of patient and/or technique survival in incidents PD patients, and there was also no difference among income groups according to causes of death or dropout. This seems to be the first time that outcomes have been evaluated according to family income in PD patients, in spite of several earlier published studies examining survival in PD. Our results indicate that poverty may not have a significant effect on technique and patient survival. Because many other studies have shown that socioeconomic deprivation is clearly associated with poor outcomes (1,4,5,14,15), it is striking that different ES groups of PD patients, including patients under EPL, had no significant differences in technique and/or patient survival. In a time with an increasing demand on dialysis capacity in combination with a limited amount of financial resource, obstacles for choosing PD therapy must be removed to respect future stage renal disease ESRD patients' preference on dialysis modality selection. According to the results presented here, the concept of poverty as a barrier to the choice of PD as RRT should be revisited wherever it is still applied, and for patients wishing to do PD, poverty should not be a reason to deny such therapy. José Carolino Divino Filho is a Baxter employee. Roberto Pecoits-Filho and Natália Fernandes have received consulting fees from Baxter. We thank all of the centers participating in the BRAZPD, Ed Vonesh, Bengt Lindholm and all of the Brazilian Baxter Renal team for their important contribution to this project. This study has been funded by Baxter Healthcare Corporation, Brazil. You are going to email the following Family Income and Survival in Brazilian Peritoneal Dialysis Multicenter Study Patients (BRAZPD): Time to Revisit a Myth?